Canon is expanding the imagePRESS C850 Digital Color Press series, adding new features and add-ons. The new optional POD Deck Lite XL Long Sheet Feeder can help printers run continuous auto-duplexed long sheets of sizes up to 13 by 30 inches. These additions means print professionals will be able to create applications such as book covers, maps, six-panel brochures, large posters, banners, dust jackets, point-of-purchase signage, folders and calendars, quickly and easily. All can be done in one workflow designed to be seamless, versatile and productive. The imagePRESS Servers H300 V2 and G200 provide new management tools to help users print jobs correctly the first time. Canon’s PRISMAsync Color Print Server version 6 offers embedded color verification and validation, helping to achieve optimal, predictable print quality. The redesigned user interface further helps printers navigate quickly. For the imagePRESS Server H300 V2, there is the new Media Librarian feature, simplifying the process of creating, editing and organizing media stocks on imagePRESS devices. 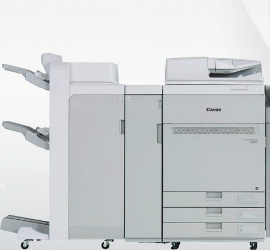 The imagePRESS C850 Digital Color Press Series offers users outstanding quality, productivity and versatility in a compact, scalable footprint. Designed for print providers, this color press is equipped to handle a variety of media options, taking your print shop into the new millennia.